The epitome of glamour, the Velvet Ribbon boasts 631 diamonds, totalling around 53 carats. The fully-paved ticker has a fascinating invisible setting at the centre, but also demonstrates more traditional techniques like tapered, claw, Clou de Paris, bead and bezel settings. Incorporating premium specimens of the world’s most sought-after stones, the Precious Chopard collection is an iridescent display of diamonds, sapphires, emeralds and rubies. 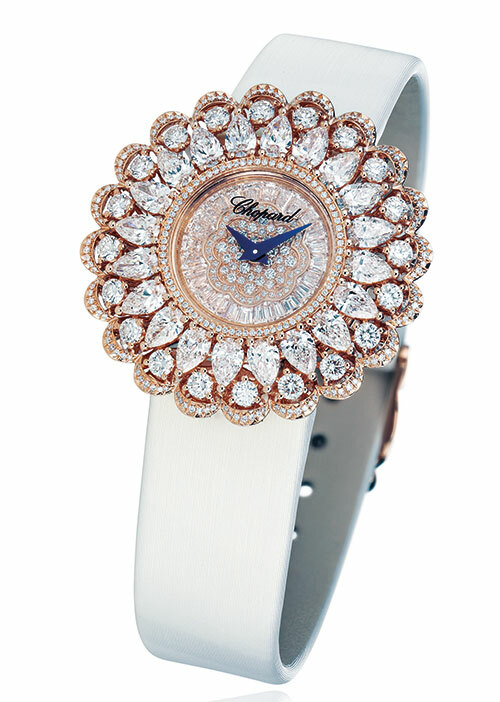 Two versions of the watch have been created — one with a satin strap and another with a bejewelled bracelet — the dials of which are adorned by either a combination of stones or with pear-shaped or round-cut diamonds arranged in a lace pattern. 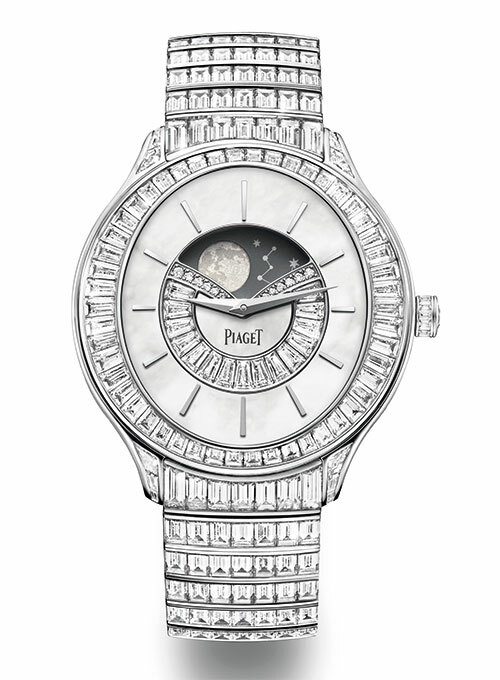 The Limelight Stella range features a 39-mm white-gold watch with a baguette-cut, diamond-set bezel and a showstopping moon phase aperture framed by more diamonds and a mother-of-pearl dial. 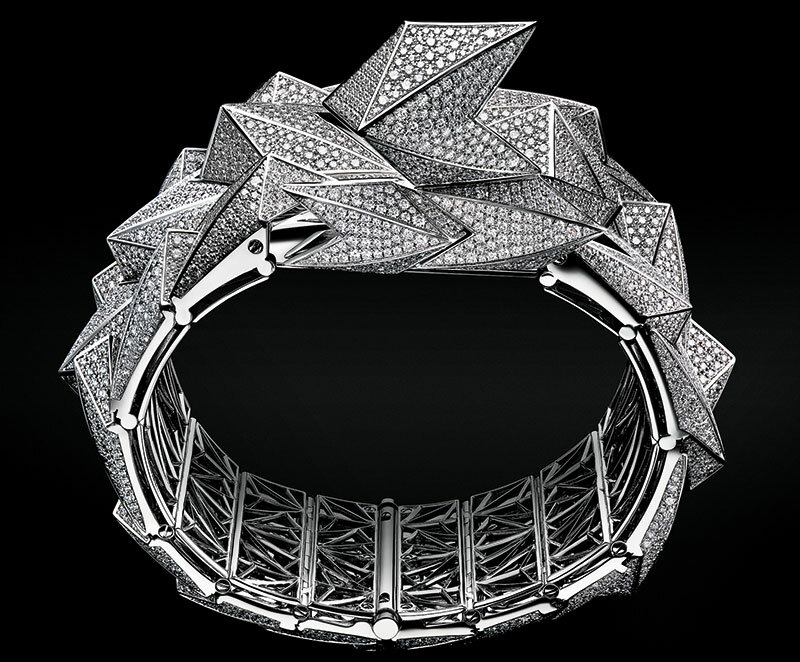 Taking it one step further, a diamond-set bracelet exhibits the art of Parisian mesh technique and gem-setting mastery. 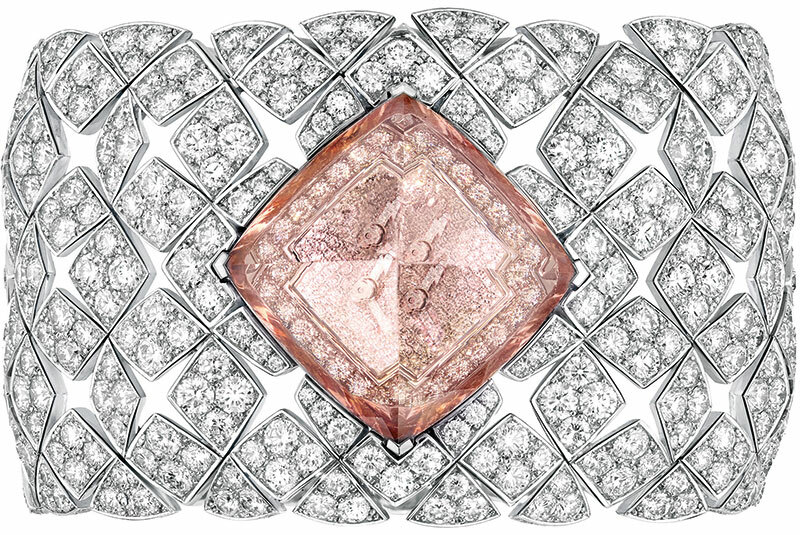 Inspired by Gabrielle Chanel’s iconic matelassé or quilted motif pattern, the Les Éternelles Signature Morganite Secret features the design on a blinged-out white-gold bracelet. The central 43.66-carat pink morganite pyramidal cabochon can be lifted to reveal a tiny dial embellished with round diamonds. 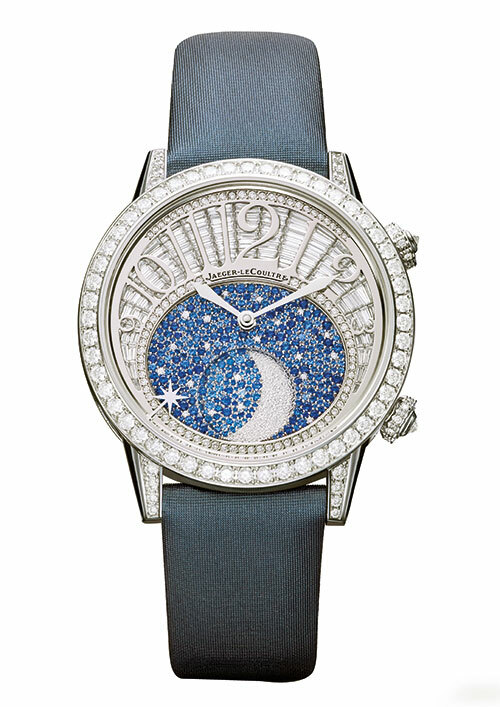 No less than 301 sapphires of varying sizes adorn the dial of the Rendez-Vous Moon High Jewellery. 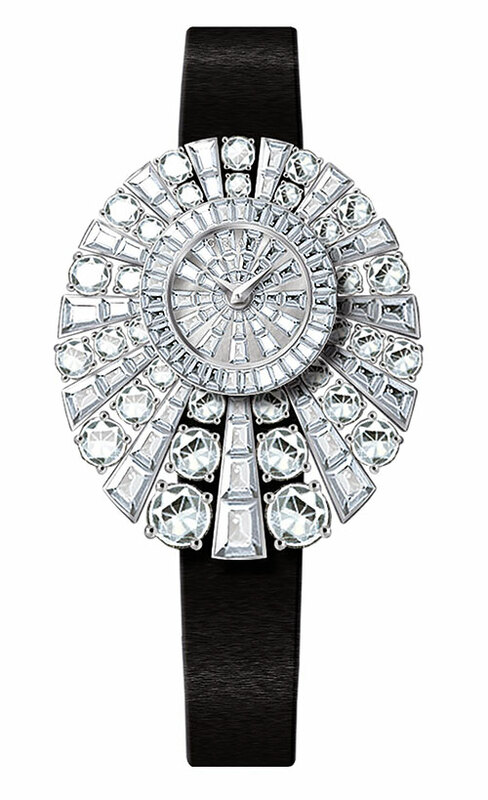 The stones are snow-set (a technique developed by the brand) on the timepiece’s lunar phase subdial to denote the night sky, accompanied by a star-shaped indicator and encircled by diamonds. With 4,635 brilliant-cut diamonds in the case and bracelet, over and above another 206 on the dial alone, the Diamond Fury is a force to be reckoned with. The armour-like creation introduces the ‘suicide hinge’, where one of the spikes unhinges to reveal the pavé-encrusted dial with two blackened-gold hands. In the Dragon Mystérieux, the fierce creature of fantasy wraps itself around the brand’s renowned ‘mysterious dial’, which creates the illusion that the hour and minute hands are floating freely in space with no visible connection to the movement. A faceted cushion-shaped 23.77-carat fire opal lies between its horns and two emeralds mark the eyes, while the scales are made of coral and onyx. The latest overhaul of a classic creation, the Amadeo Fleurier Flower of Life can be treasured as a traditional wristwatch, an elegant pendant, and even a table clock. 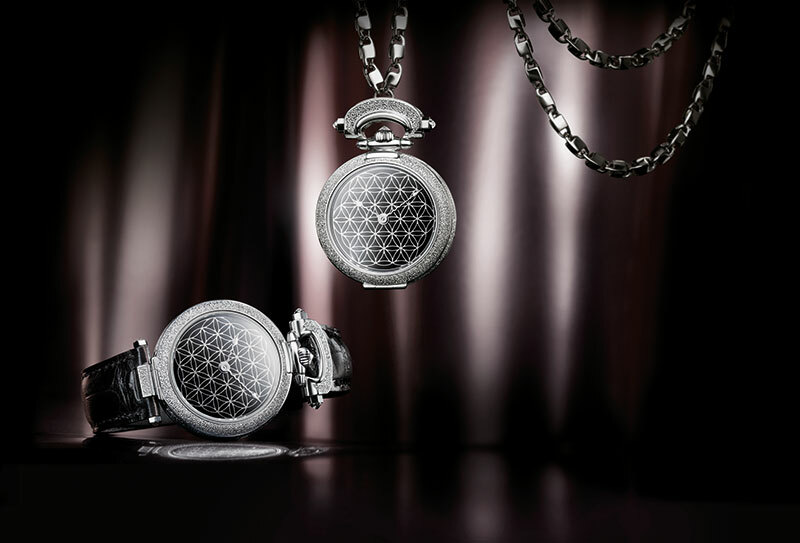 In addition to the 1.5 carats of diamonds on the case, the red-gold version has a mother-of-pearl off-centred dial while the unique white-gold version flaunts black grand feu enamel…both engraved with the ‘flower of life’ symbol. Mesmerisingly elegant, the Rosebud Heart is another ticker that can be transformed into a pendant when not fastened to the wrist with its sleek satin strap. 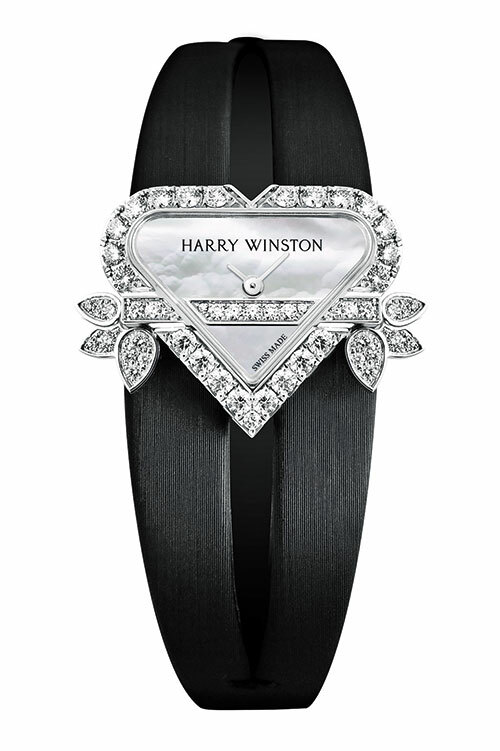 And, adding more romance to the heart-shaped case are 86 brilliant-cut diamonds. 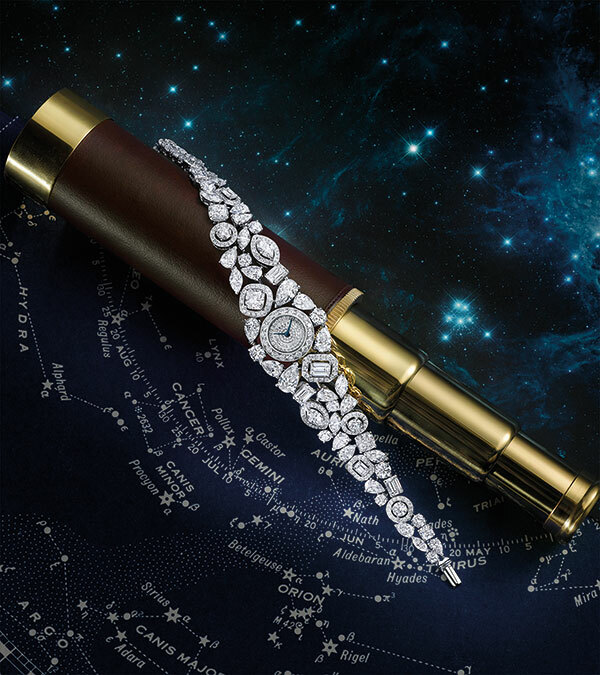 Recalling the illumination of a night sky, the Celestial incorporates a pavé halo of diamonds…over 29 carats in all. For the Peacock, designers have drawn on the natural geometry of the bird’s feathers — in particular the ‘eyespot’ that features at its centre. 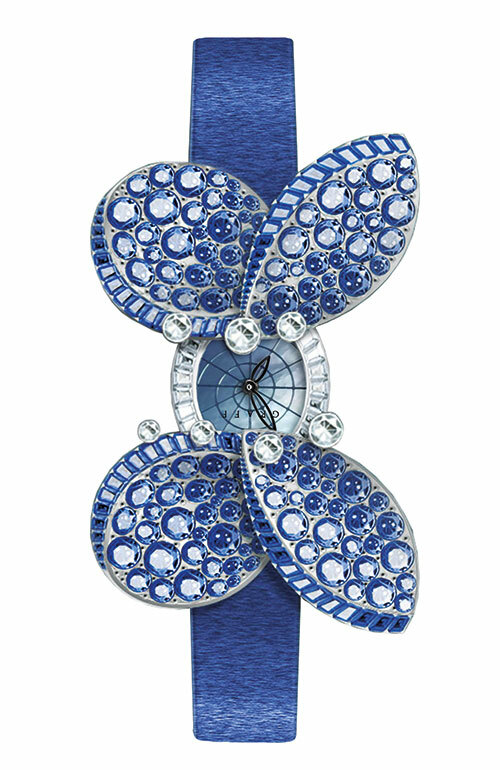 And, in an exotic literal personification, the Princess Butterfly uses advanced 3D technology to bring to life a highly sculptural version of the insect that is depicted by pavé wings with a dégradé of sapphires, concealing a mother-of-pearl dial. 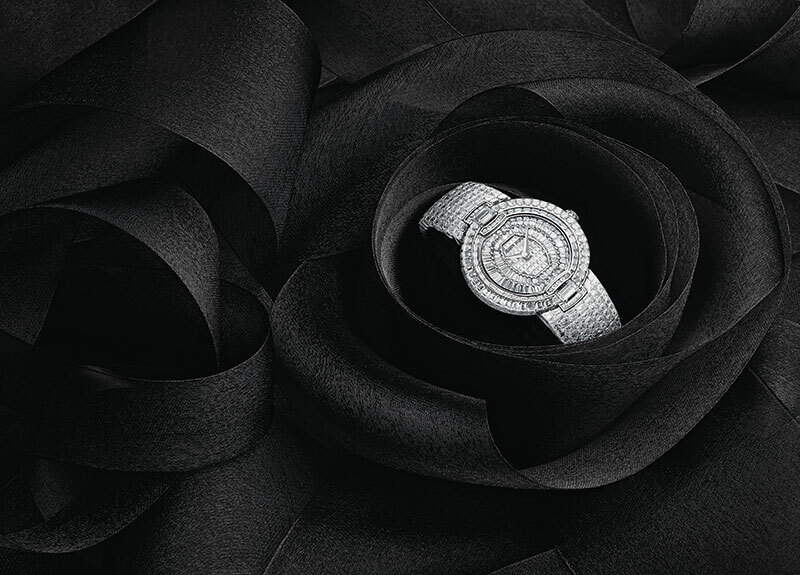 The Joy De Lumière High Jewellery is the quintessence of femininity. Offering a petite silhouette that sits daintily on the wrist, the white-gold creation features a white mother-of-pearl dial and a gadroon bracelet, both set with diamonds. Produced in a limited edition of 88 pieces, the Pathos Swan Bicolor’s are peppered with precisely 922 diamonds and sapphires. The watchmaker’s careful attention to detail is evident in the delicate hour and minute hands, which sit atop a glistening mother-of-pearl dial. In a fantastically absurd move, the brand caused a simultaneous sharp intake of breath around the horological world when they revealed a watch made out of a solid pink sapphire. The RM 07-02 Pink Lady Sapphire Automatic, besides offering a highly distinctive look, also features a visible skeletonised movement made from solid red gold. On the RM 51-02 Tourbillon Diamond Twister, 14 diamond-encrusted rays form a spiral vortex like that of the Milky Way, framed by a sparkling tonneau case. 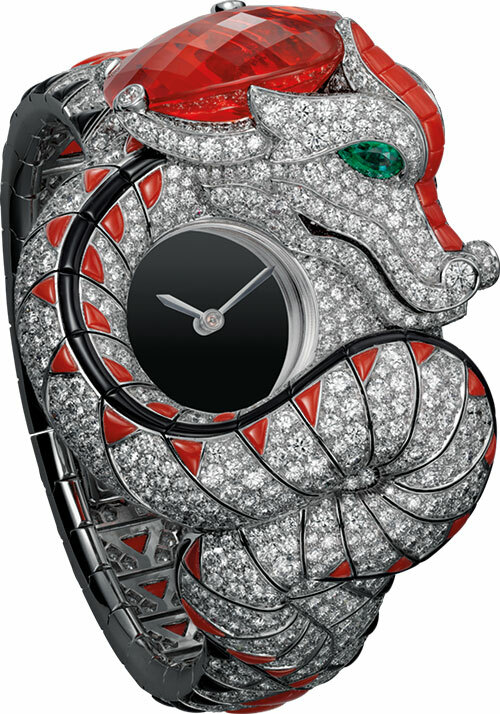 The RM 026, however, sees an emerald- and diamond-encrusted snake with a red coral tongue slither alongside a ruby- and diamond-encrusted one, both mounted on a black onyx baseplate. 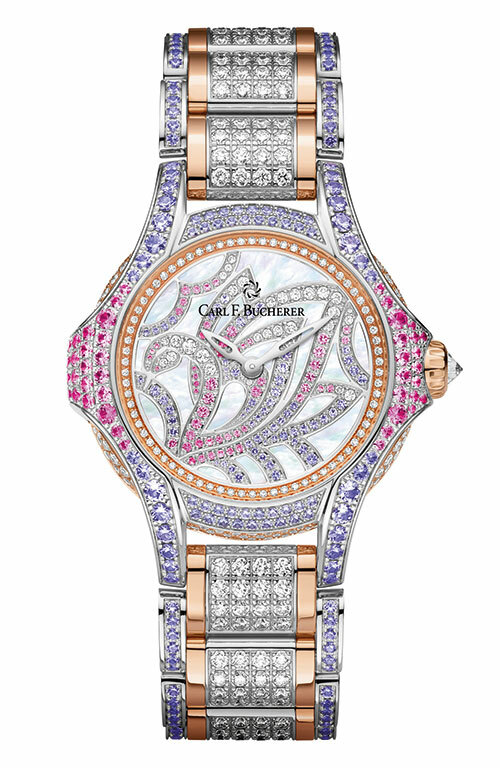 Celebrating southern France’s most-loved season, the Summer In Provence Multi-Coloured Sapphire makes a dazzling impression with 379 stones on its case and another 337 on the dial. 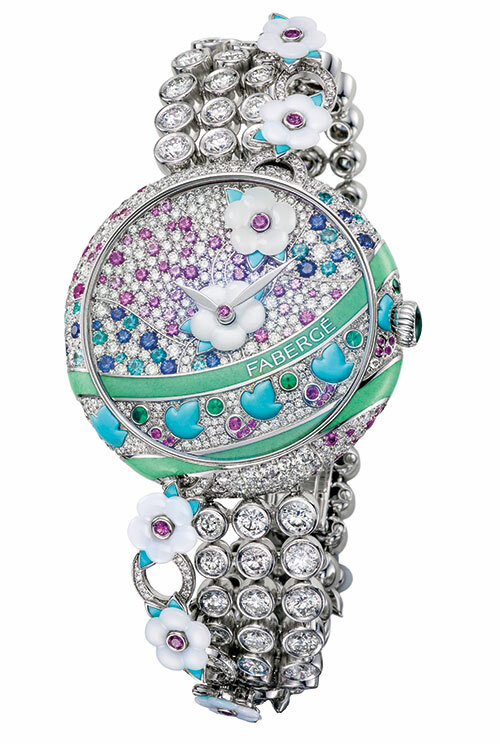 The delicate bracelet, made of diamonds strung together like necklace beads, is dotted with white mother-of-pearl flowers that continue onto the dial alongside emeralds, multi-hued sapphires, turquoises, enamels and Paraíba tourmalines. 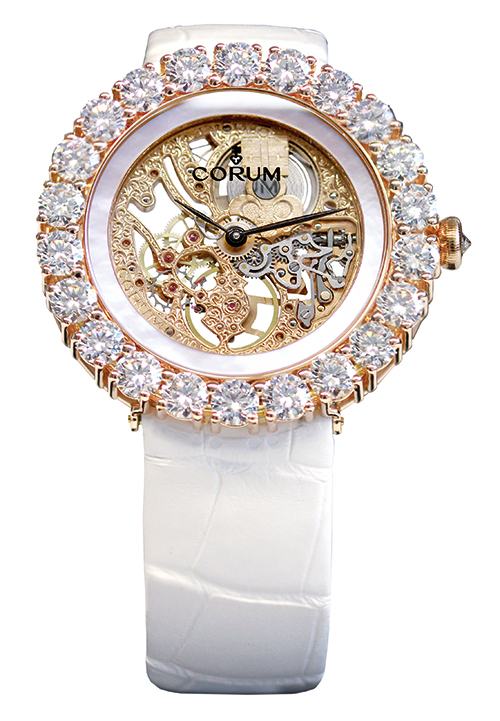 Inspired by a unique diaphanous ‘skeleton flower’ — in design and nomenclature — the Heritage Diphylleia sees a row of 22 diamonds enclosing a round case and openwork mechanism. Crafted in 18-carat rose or white gold, it is further enhanced by a white-pearl bezel.